Located directly on the Phillips Chain of Lakes for fishing, swimming and recreational activities, DIRECT access to miles of Spectacular ATV and snowmobile trails, and a short drive to cross country skiing with rentals, ice skating with rentals and memorable SLEIGH RIDES! THIS PLACE HAS IT ALL - for your getaway vacations. Start creating special family memories!! THIS HOUSE IS ALSO DIRECTLY ON PRIME PRICE COUNTY ATV AND SNOWMOBILE TRAILS!! We made it all easy for you! We have provided you with a prime 600 FEET OF SAND FRONTAGE 2.5 ACRE LOT and a GOURGEOUS 3000 FOOT 5 BEDROOM OPEN CONCEPT LAKE HOUSE with boats, EXCELLENT swimming and fishing. GREAT FOR KIDS AND ADULTS OF ALL AGES. 21 foot very nice family owned pontoon boat to rent with your stay if you request. FREE paddle boat and row boat come with your stay. FREE FIREWOOD PROVIDED for the FIREPIT. 2 large docks, a swim raft with attached chairs and table for relaxing and pure enjoyment - Firepit and breathtaking views of the lake as the lake wraps around the entire lot!! ARE YOU READY FOR AN 'AWESOME' VACATION? ONCE YOU VACATION HERE, YOU WILL WANT TO COME BACK! We've had rave reviews!! Our 5 bedroom AIR-CONDITIONED luxury home offers lots of comfort and space for you and your guests and with many amenities. This 3000 sq. foot home has large open and comfortable rooms for you to enjoy. We are popular all year round for all seasons. 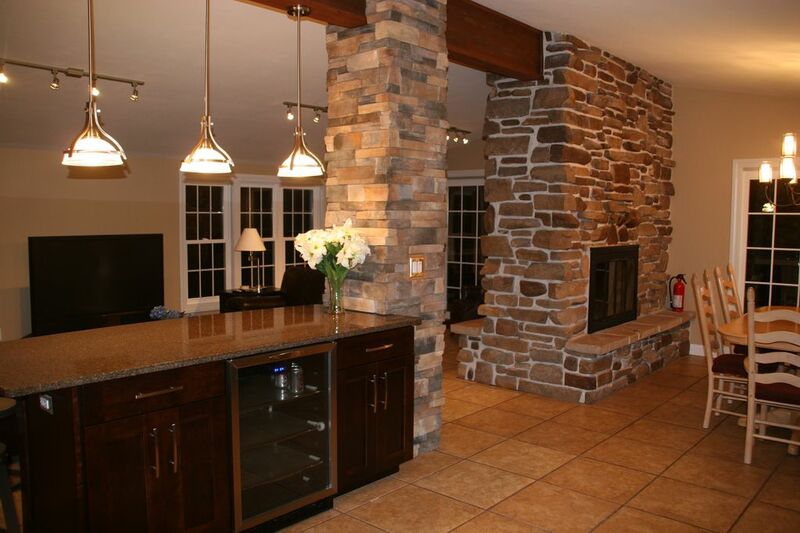 This classy, contemporary home is located on Long Lake, (a 425 acre lake, the largest of the chain of lakes). It is a total of 1236 acres of pristine waters for waterskiing, fishing or leisure pontoon rides), the property includes a flat, large, wooded 2.5 acre private lot with 600 feet of Spectacular Sandy Frontage (no weeds) that wraps around the house to offer quiet and picturesque views of the lake. Great for family time with provided games of croquet or kickball or baseball. This fabulous home offers a quiet, peaceful atmosphere with fabulous southern exposure, amazing sunsets, and is perfect for all seasons of the year. This prime property is located with direct access to many of Price County's groomed snowmobile trails and ATV trails. You have a direct line to 5 amazing ATV trail systems to explore and gather at different dining establishments and enjoy the camaraderie. The snowmobile trails connect right out the back door with lake access to over 500 miles of meticously groomed trails through National Forest and State Trails. Price County Wisconsin Trails were referred to as PRICELESS! by American Snowmobilier (Nov. 2006). Price County is one of the top 10 snowmobile destinations in North America as rated by SnoTrax Internation Magazine (Fall 2003). Walk out patios on the lower level take you to excellent fishing on 2 different docks. Muskys 38 inches caught right off the dock. Young children will enjoy catching their first fish as well - walleye, bass or panfish. Several unoccupied islands surround the house making for great fishing destinations! Great also for older children to take a paddle or row boat ride to the islands to explore!! Some of the best public hunting lands in the state and in conjunction with the Ruffed Grouse Capitol of the World is found right in Price County. You can find deer, bear, wild turkey, and small game. Local guides are available. After spending the day outdoors, relax and enjoy the indoors with the entertainment of foosball, darts, pool or watching movies or sports on the dish network in the large entertainment room with the gas fireplace or next to the large 2-way large stone fireplace. 5 Bedrooms (1 King, 3 Queen, 1 Bunk Bed with a twin top and full bed on bottom, separate twin). All Newly Remodeled Full Kitchen, dining room, living room in 2012. Dark Cherry Cabinets with Quartz Countertops, new stainless steel appliances including a undercountertop beverage center in the large island. The large quartz island fits into the beautiful hand craft stone pillars that are in the center of the room. The kitchen can comfortably seat 12. The open concept and vaulted ceiling combines to the large 40 foot long living room with views from all angles in the 2 sliding glass doors to the large deck customized deck and the spectactular rows of ceiling to floor new white trim windows. The windows wrap around the entire large space to allow cool breezes, amazing views and sounds of the loons. Also includes a lower level with a quartz top bar, 8' pool table, foosball, darts. After a fun filled day, sink into the softness of a plus 'pillow top' mattresses fitted with new high quality, high thread count sheets. The bedrooms are decorated with a 'French Country' style, finished with white trim and six panel doors. A master bedroom also includes a private bath. The lower level family room has it all! It's a comfortable, inviting room with warm faux finished walls, recessed lighting, plush carpeting, leather furniture, Bar, and oak flooring. It's a great place to relax and have fun. It is equipped to watch sports on the DSS, watch movies on the DVD/VCR, play pool (on pool table), foosball, darts, board games, or relax next to the gas fireplace. The room allows you to walk out to the beautiful serene back yard with padded patio furniture and large trees for a nice mix of sun and shade. There is also a huge yard for outdoor activities (volleyball, croquet, etc). Ample parking on long black-top driveway. Row boat, paddle boat, life jackets included. EXCELLENT SWIMMING BEACH! 600' of sandy frontage! Layout or play on our 8' x 10' swim raft. Watersports and fishing are popular from the two private docks and throughout the Chain of Lakes. The chain also includes a nine hole golf course, three restaurant/bars with outdoor dining, ALL OF WHICH YOU CAN BOAT TO! In addition, the Flambeau and Elk Rivers are located nearby and provide excellent canoeing, kayaking, tubing and fishing. Local pontoon, canoe and kayak rentals are available. THE PUBLIC BOAT LANDING IS LOCATED JUST 1/8 OF A MILE BEFORE PROPERTY!! During the fall months, this property is an excellent option for hunters. Phillips is located within minutes of thousands of acres of excellent public hunting land and 20 minutes south of the Grouse Capitol of the World, Park Falls. For the fishing activists, this property has excellent fishing from its private docks and nearby islands. The Chain of Lakes offers different types of fishing (walleye, bass, panfish, northern, musky, crappie). For the fly fisherman, we would recommend trying the nearby Elk River. ATVers have direct access to the finest trails in Price County (Flambeau Trail System) and are open year round. Price County is one of the top 10 snowmobile destinations in North America as rated by Snotrax International Magazine (Fall 2003). This property has direct access to these groomed snowmobile trails and excellent ice fishing. This property is also located nearby several cross country trails and within 90 minutes of many ski resorts (resorts from Wausau, WI to Upper Michigan). Maps for hunting, fishing, ATVing and snowmobiling available. 9 hole Westwoods Golf Course located on Long Lake - docking available to boat to - great food and dining available. Beautiful home. Perfect getaway with something for everyone! Beautiful home. Everything you would possibly need. Fun for the adults and kids as well!! We loved it. Already started planning our next trip back the first night we were there! Thank you so much Jennifer! You were wonderful guests! We enjoyed having you, and we are thrilled to have you and your family return! Our mixed family rented this home for a New Years Snowmobile retreat, however Mother Nature had other plans. No Snow for new years, we decided to still head North for some relaxation. The Kids and Guys enjoyed Ice Fishing on the lake right out the back door. We enjoyed the wood Fireplace and the kids loved having their own area in the basement. Kitchen was stocked with everything we needed for a big New Years dinner. The owners were very pleasant. Thank you so much! We are thrilled that you had a great holiday stay with your family and loved having you as our guests. We love knowing our large 5 bedroom home fit your needs and helped provide wonderful memories with your family. The house had everything we expected and was very well remodeled as well as stylishly modern. We had a great time with 3 generations under one roof...plenty of space and plenty to do. There were 3 different docks allowing us to bring 2 boats and we rented there pontoon as well...still with room to spare. The third dock was around the corner, which was cool because the 3 docks were spread out; the boat docks were on one side of the peninsula and the other dock and floating barge was around the corner (you could therefore just relax, swim or get away from others and spread out as needed). The bonfire pit was great as well. Long lake was great with many islands as well as several bars/restaurants and even a golf course right ON THE LAKE...we will definitely be back! We had a great New Year vacation! The house was big enough to accommodate our group of 9, all the amenities that you can get. The game room was a nice plus for an excellent time with friends or family. Very nice location, right on the lake, I bet it is great in the summer also! Close to town and at the same time enough privacy! Amy was very nice giving us all the information that we needed. I will definitely recommend this to friends and family. We had an amazing time at this property - gathering a family of 12 (5 kids ranging from 1 - 11 years old). It was clean and tidy and had a well stocked kitchen. Bedrooms were comfortable and thanks to the family spaces on both floors we never felt crowded, even on the one rainy day. We enjoyed the pontoon boat and rented kayaks from town and spent most of the week in the lake, and the docks and sandy entrance was perfect. It's a beautifully sited cottage - you're not aware of any other houses or neighbours - and it's also a convenient 10 minutes from the supermarket in town which is extremely well stocked. I would highly recommend this and can imagine that in the other seasons it's a gorgeous fall or winter retreat. I recommend this beautiful home for any get away you may have. Cancellation policy, off season forfeit of deposit less than 60days. Summer 1/2 of rental amount plus deposit less than 120days.